You are here: HomenextTopicsnextTransportnextWickford Park Garage. This photo was identified today as Fuller and Gadstones Garage, Nevendon Road. 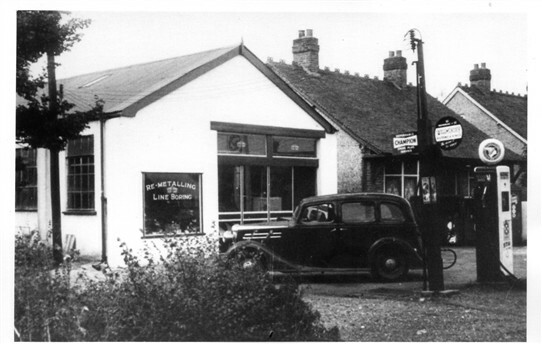 There were two garages along the Nevendon Road – this one and a BP garage. Can anyone pinpoint where they were on the road, and does anyone have a photo of the BP garage? I started my working life here, Mr Fuller was a hands-on guvner, I remember Sid the foreman, Wilf a brilliant engineer, Len who worked in the plant repair side, Harry for motorcycles, Tom from the stores, helped by David, Lionel a good bloke, Vic lived off Southend Road, Pete who rode a Vincent cycle. Was a good time until being taken over by Holmes and Smith. It was opposite PARK DRIVE. I use to get paraffin there. Apparently, so my wife tells me, the other Garage was somewhere opposite Oakhurst Drive, in Nevendon Rd, possibly where the row of shops are today. Perhaps someone can confirm this, not Kershaws corner. This photograph and information about the garage is on the website at a number of locations. First a correction, the garage was not called Fuller and Godstone’s Garage, it was called Wickford Park Garage, also known as WPG. The garage was run as a partnership by my father Charles (Ginger) Fuller and ‘Pat’ Gadsdon and they traded as Fuller & Gadsdon. It was located on the corner of Nevendon Road and Grange Avenue. Grange Avenue is to the left of the photo. The BP garage was possibly built in the 1970’s. The partners had a second garage on the bottom of Southend Road. This garage was called Southend Road Garage (SRG) but was a limited company – Fuller & Gadsdon Ltd. Pat Gadson was a third shareholder, my father, Charles (Ginger) Fuller, was a third share holder and Fred Norton, owner of an Aggregates company which was bought by Carter & Ward, owned the last third of the shares. My father, Ginger Fuller, ran on a daily basis Wickford Park Garage on Nevendon Road. On a daily basis Pat ran Southend Road Garage. Both partners spent time in each garage.